Book hotel rooms online with us at Hotel Apartamento Paraiso De Albufeira at the lowest rate, guaranteed. Get a holiday discount room rate at the 4 Star Hotel Paraiso do Albufeira Apartments located in central Albufeira in the Algarve. The apartment hotel has 414 holiday units ranging from studios to one or two-bedroom self-catering apartments offering holiday accommodation from 2 to 6 persons. Each unit has air-conditioning, satellite TV, a good functional kitchenette and a private balcony. 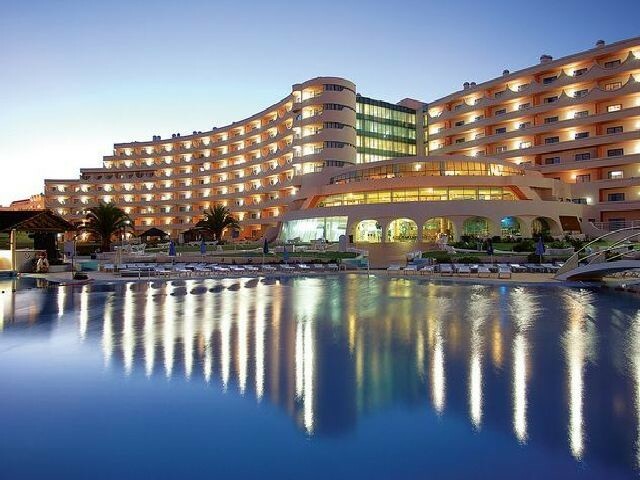 Hotel Paraiso do Albufeira Apartments in the Algarve provides many facilities which include seven on-site entertainment venues, three restaurants, bars, large indoor pool area featuring a hot tub, two well equipped games rooms, massages, shops and a chapel. Outside is an impressive lagoon swimming pool area with sun loungers, landscaped gardens, tennis court, mini-golf, a Kids Club and playground. Wi-fi is available in public areas.